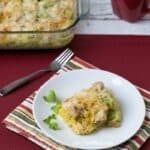 This easy chicken tetrazzini casserole recipe is a great way to use up leftover chicken or turkey. Poached chicken can also be used if no precooked meat is on hand. I just love winter squash because it has such a long shelf life. 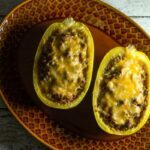 My all-time favorite is spaghetti squash which is such a great low carb gluten free replacement for pasta. 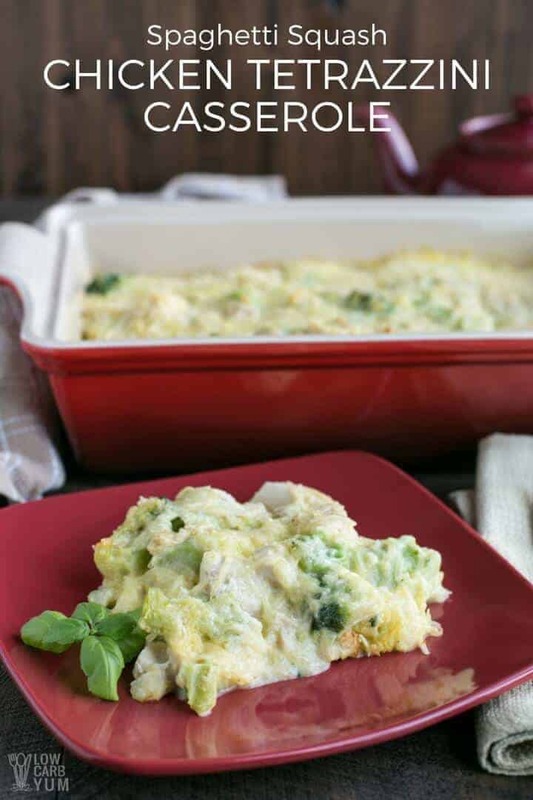 One dish I make is a broccoli spaghetti squash casserole. Like most of the other hard shelled winter squash, spaghetti squash is harvested in the early fall. We eat a lot of winter squash at this time of the year because it is so abundant and widely available fresh in the markets during the fall season. 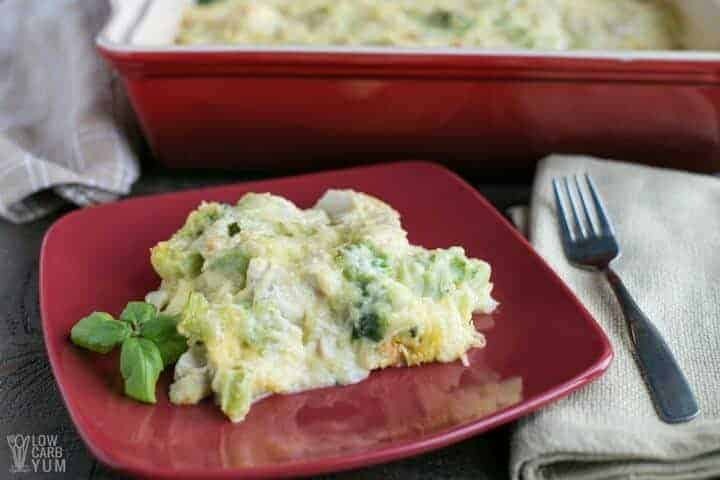 This recipe for a low carb gluten free chicken tetrazzini casserole uses spaghetti squash instead of regular pasta. Tetrazzini usually has mushrooms in it, but I left them out in this recipe. 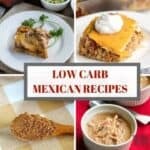 Mushrooms are low in carbs so they could added if desired. I chose to add a bag of frozen broccoli in place of the mushrooms. 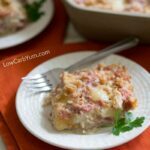 That makes this easy casserole a one dish meal since it contains both meat and vegetable. Tetrazzini is a perfect recipe for using up leftover chicken or turkey. 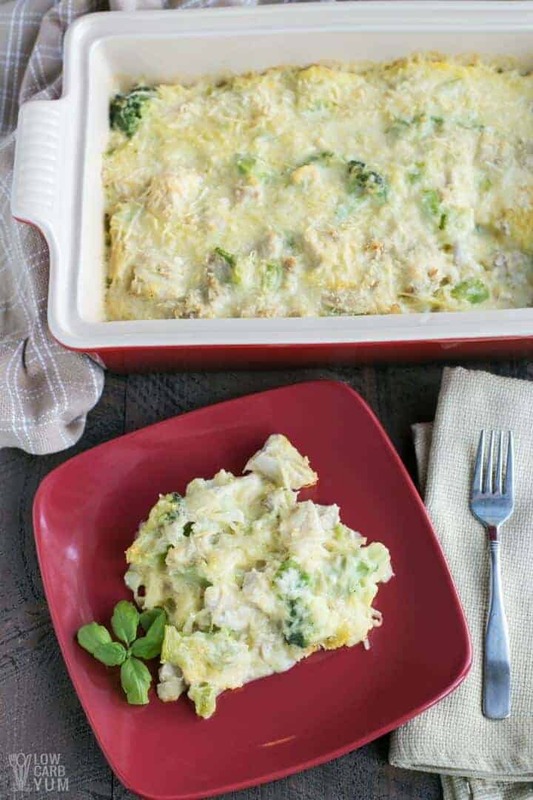 It uses a couple cups of diced cooked poultry so keep this casserole in mind for using up those Thanksgiving leftovers. I didn’t have any precooked meat so I poached some skinless and boneless chicken breasts and thighs in my Instant Pot. Like roasting, poaching keeps the meat juicy and doesn’t sear the edges like pan frying. If you have an electric pressure cooker and need some cooked poultry, it’s a cinch to poach chicken or turkey under pressure. I just set my Instant Pot on high and set the cook time to 8 minutes. Then I do a quick pressure release. 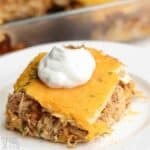 I also cooked the spaghetti squash in the pressure cooker for this easy chicken tetrazzini casserole. Cooking this winter squash in the Instant Pot comes out perfect every time. The electric pressure cooker is also great for making pumpkin puree. 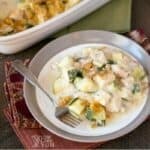 You will need to make a quick cream sauce for the chicken tetrazzini casserole. But, it comes together fast and is super easy. It should only take a few minutes to prepare. Once the sauce is done, you just add in the spaghetti squash strands, the broccoli, and the cooked chicken pieces. Then, the whole mixture is spread out into a casserole pan. I like to top the casserole with some shredded parmesan sprinkled all over. 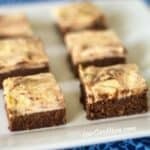 It should get a little crusted during baking if you let it brown at the end. Additional grated parmesan can be sprinkled on top of each serving if desired. 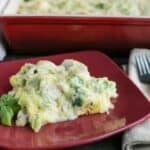 The creamy parmesan sauce goes well with the chicken and broccoli. 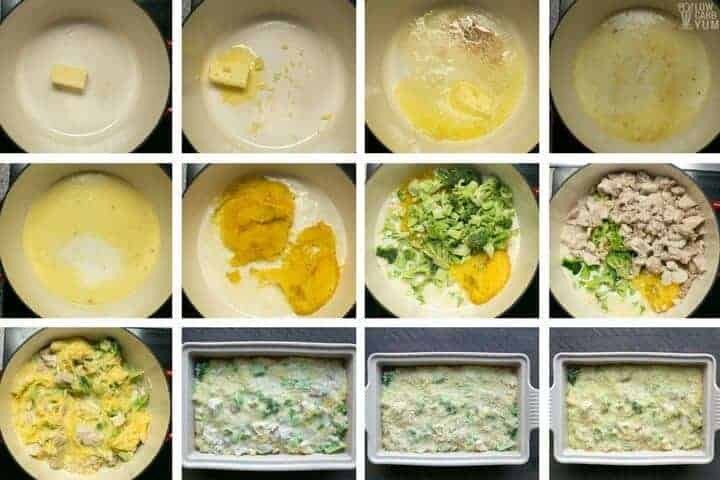 I’ll be making this super easy chicken tetrazzini casserole dish again after Thanksgiving to use up any leftover turkey meat. My chicken spinach tomato one pot dish is another great recipe for using up cooked poultry. 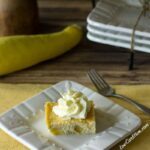 If you’re looking for an amazing keto dessert to serve with this casserole, check out my low carb tiramisu. 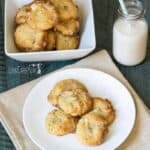 It’s my absolute favorite dessert and I’m so glad I have a version I can enjoy on this way of eating. What’s your favorite way to use up extra cooked chicken or turkey? I’m always looking for more ideas. 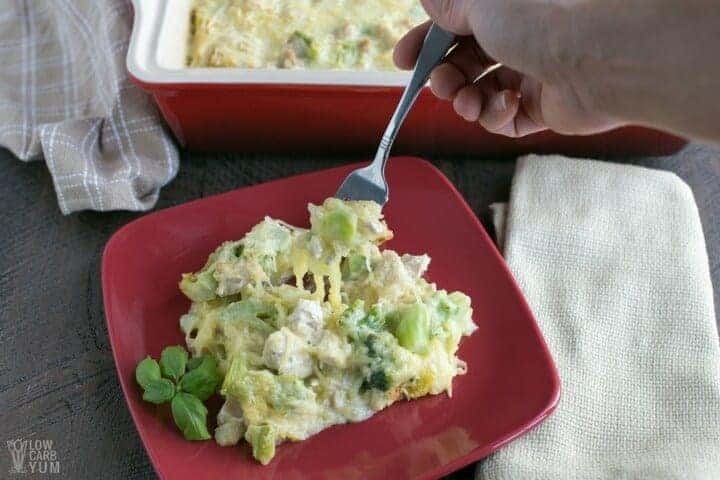 This easy broccoli chicken tetrazzini is a great way to use up leftover chicken or turkey. Poached chicken can also be used if no precooked meat is on hand. Prepare spaghetti squash and set aside 7 cups of the cooked flesh. If using, poach chicken breasts in boiling water until no longer pink. Cut into cubes after slightly cooled. In saucepan over low heat, melt butter and saute garlic. Stir in broth, whipping cream, sherry, xanthan gum, salt, and pepper. Heat to boiling, stirring frequently. 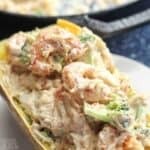 Stir in spaghetti squash, broccoli, and chicken or turkey. Pour mixture into ungreased casserole dish. Sprinkle with parmesan cheese. Bake uncovered at 350°F about 30 minutes.